Many students rise to a position of leadership on campus ... and then don’t have a clue how to lead in the role. This app will assist you in your journey to become a stronger Student Leader. Whether you are running a student club, serving as a Resident Advisor, mentoring other students, or captain of a sports team, you need to know how to lead peers. Ideas for creating inclusion, maintaining engagement, mentoring and coaching, and managing the logistics of a campus fundraising event are all covered in this app. 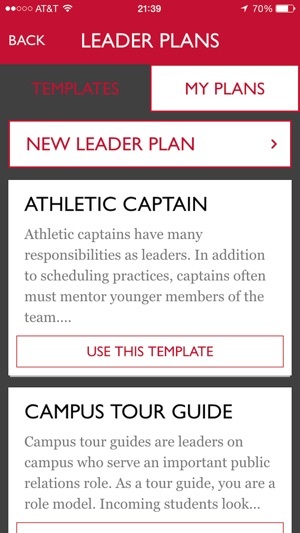 - Customizable ‘Leader Plan’ templates for key campus leadership roles, such as Athletic Captain, Resident Advisor, Fundraising Chair, Internship Project Management, Campus Tour Guide, Retreat Leader, Service Project Leader, Event Planner, Senior Week Chair, or Student Government Leader, and other campus leadership roles. - ‘Notes to Self’ that allow you to make notes about leadership tasks where you can set calendar reminders. - A ‘Leadership Legacy’ notepad that includes reflections on your leader role and how you can improve as a leader in the future. - Mentor and coach performance, handle Residence Advisor or Athletic Captain roles, as well as manage student stress. - Accept responsibility on a student internship task force project. - If you are welcoming new students on campus as a New Student Orientation leader, you can create a Leader Plan about how to acquaint your new first-years with the multitude of activities on campus. - If you are running a Campus Fundraising Event, you can identify ways to manage the event with team captains and handle the logistics of event planning. - If you are a Student Athletic Captain, you can set reminders for how you might lead by example, coach, mentor and guide teammates. - If you are a Residence Hall Advisor, you can consider ways to handle student issues, report challenges, create dorm events, and manage student stress. - If you are participating in a Business Case Group, you can identify ways to manage the meetings and meet deadlines. - If you have a Student Internship, you can develop an action plan to help you conduct your project in a way that is effective, efficient, and professional. 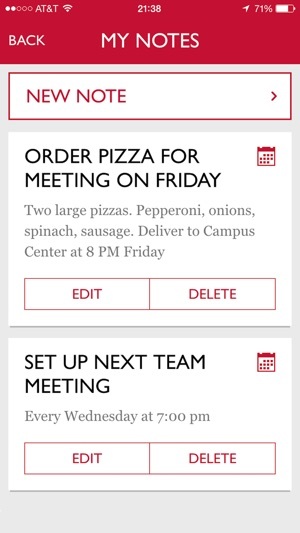 This App has been identified as a “must have” by thousands of student leaders on campus. Get it now - and start leading! Welcome to the latest version of MyStudentLeader. This version streamlines the core functions of the app and fixes some bugs. 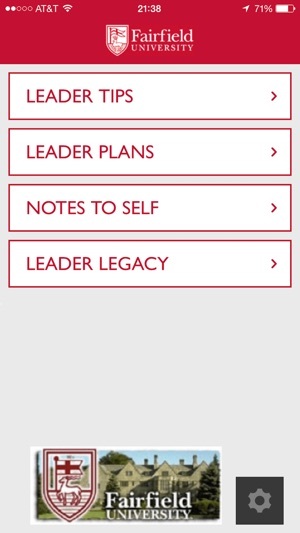 This app fuses the notes app that is already available on the iPhone and integrates it into a digital leadership plan. 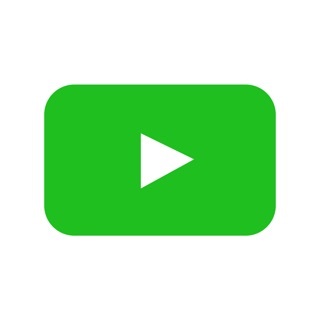 Everything you want to plan for a project is available all on this app. You can easily customize your plan and what's great is that there is nothing too complicated about this app. I love how you can easily navigate by each section. The tips that are available are fantastic and they really motivate you to achieve your goals. I will be definitely using this app so I can set up a clear plan for my future achievements. Definitely worth the money! There is nothing in the App Store that compares to the student leader app. Anyone interested in becoming a leader needs to purchase this app. From being a sports captain to a CEO the usefulness of this app is so universally helpful. It guides you step by step on how to manage yourself and gives you the ability to manage others in a successful setting. It allows you to personalize a plan and choose certain objectives to become an outstanding leader. With constant updates and improvements, the certainty of you becoming a better leader every day is very high. 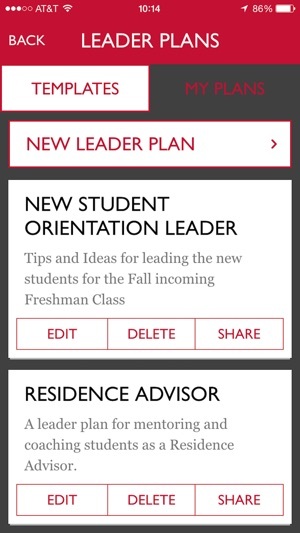 The student leadership app is certainly a must have for all students looking to further their leadership skills The layout of the app itself is very straight forward and easy to maneuver. You can learn from the several different templates of leadership and find the one that most fits the type of leader you are looking to be. 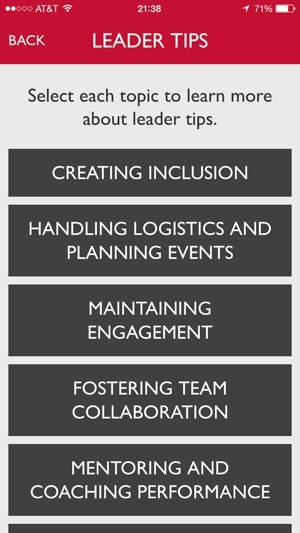 You can even add and save your own notes and tips as you go along to build and improve your leadership abilities. Certainly worth the low cost to purchase and use to your advantage.